Start > NOODLE MASTER Labs > Ramen noodle ingredients – kansui, etc. and what roles they play in making of good ramen noodles. If you're looking for supplies of ingredients talked about on this page, please feel free to contact us by clicking here"Ask the Master". The hardness of water to be used is desirably 0.5 (10 ppm) or less, please be sure to use soft water having hardness close to 0. Because about 70% of weight of boiled noodles are water content, quality of water quality has a big impact on the quality of ramen noodles. For example, if the hardness is as high as 9 degrees, the boiling time is long. Then, it will result in noodles that get soft fast in soup. If the hardness of water is 0, cooking time is short, and the noodle texture keeps longer in hot soup, and the amount of noodles melted into cooking water is less. Water quality directly affects noodle quality like this. Natural brine is a mass of stone-like white glittery crystals that can be taken from the shore of lakes in the northwestern part of China. Kansui is transparent liquid made by boiling and filtering this substance. The main component is an alkaline liquid such as potassium carbonate and sodium carbonate. Kansui circulated in Japan comes in powder form and liquid form prescribed by the Food Sanitation Law. Although powder kansui is generally a mix of sodium carbonate and some potassium carbonate, liquid kansui due to solubility, is highly concentrated kansui with potassium carbonate as its main component. Kansui may cause bitterness or smell that are unique to Chinese style noodles, and the yellow color of Chinese style noodles is actually a flavonoid type pigment such as flavone, flavonol and the like in wheat, colored due to the alkaline component of kansui. Especially, potassium carbonate acts on protein to harden noodles, sodium carbonate softens noodles. Therefore, its formulation varies depending on the type and size of ramen noodles. Usually, the smaller the size, the harder the noodle texture should be. 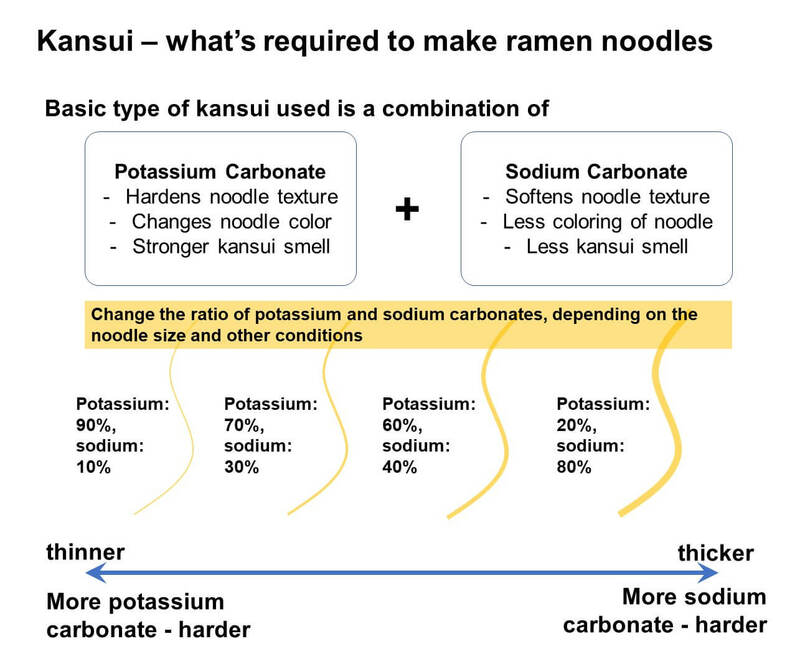 So, we increase the ratio of potassium carbonate when making thin noodles. For thick noodles, we increase sodium carbonate, which makes noodle textures soft. Hardness and size of noodles should be considered for ideal noodle textures. 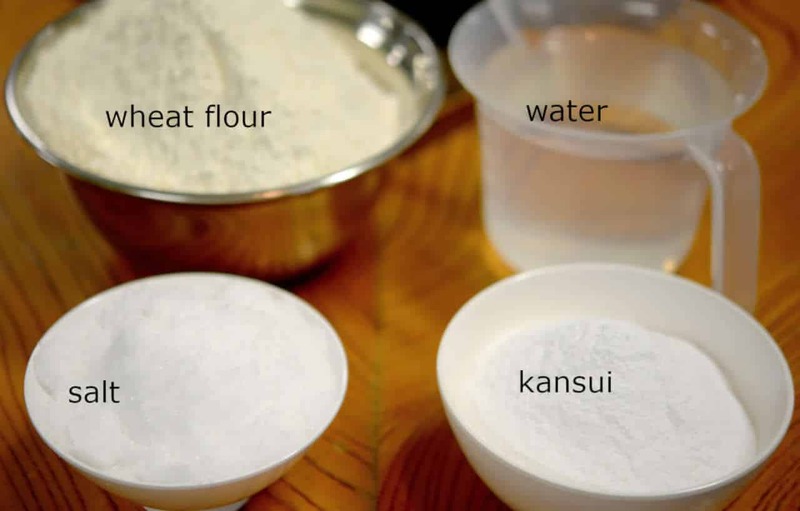 have weak texture physically due to its fineness, so in addition to using wheat flour with high protein content, kansui also reinforces the hardness by increasing the potassium carbonate content. noodles are thin and hard. So, you should increase the amount of potassium carbonate when making it. making it to keep longer, and bringing out a unique flavor and texture. Although there is a process of aging/resting in the manufacturing process of ramen, good dough can not be made if simultaneously breeding bacteria in the aging process. "Promote good resting while suppressing decaying of dough." 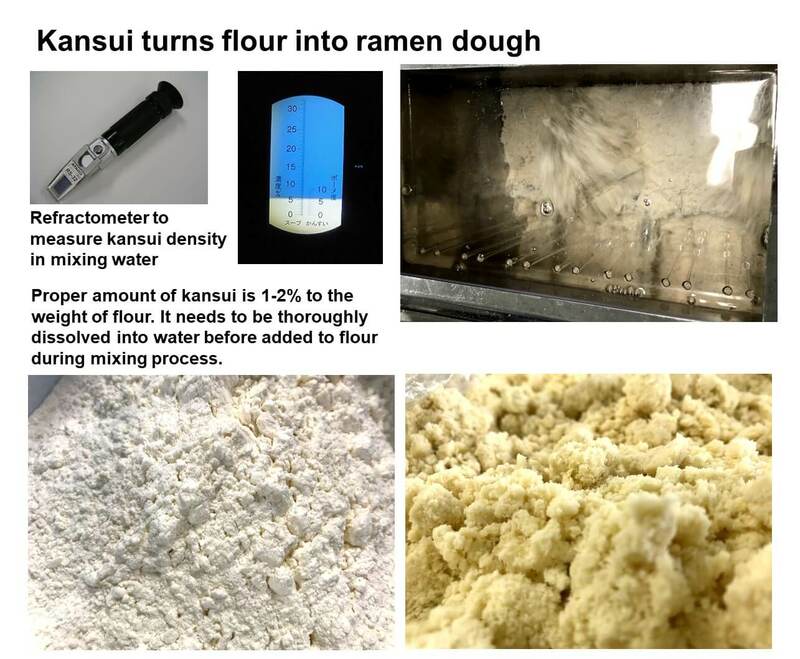 The predecessor overcame this problem by kneading kansui into dough, raising the pH to 9 or more, and making it alkaline. Kansui also plays a role of preventing noodles from melting into cooking water. It keeps noodles from dissolving into boiling water by making noodles and cooking water lightly alkaline, and this helps improve the yield of cooked noodles. Note: Although udon and soba are also noodles, because they are acid foods, they shouldn’t be cooked together with ramen noodles in the same pot. 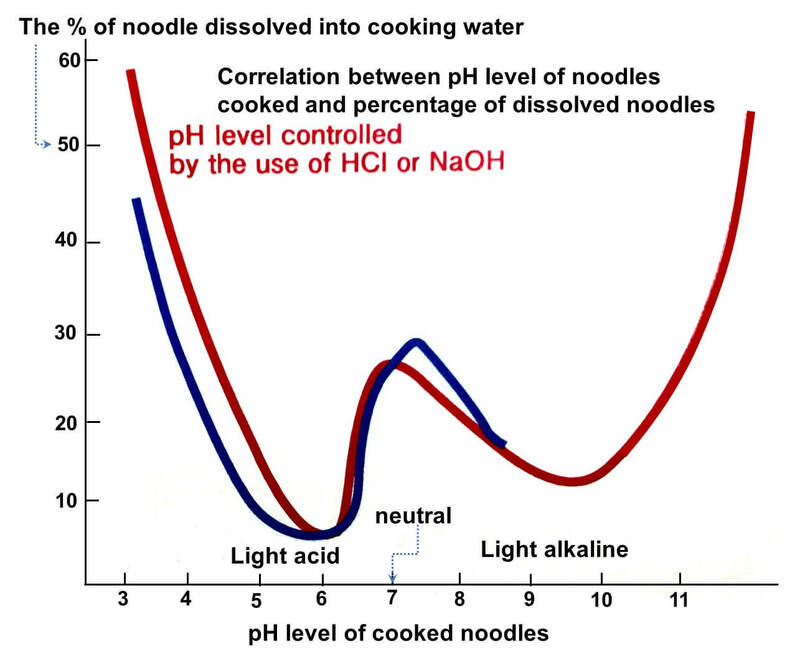 Because we are using kansui to make ramen noodles, noodles and boiling water are lightly alkaline (pH 9 ~ 10), boiling and melting of noodles are relatively small in this PH range. 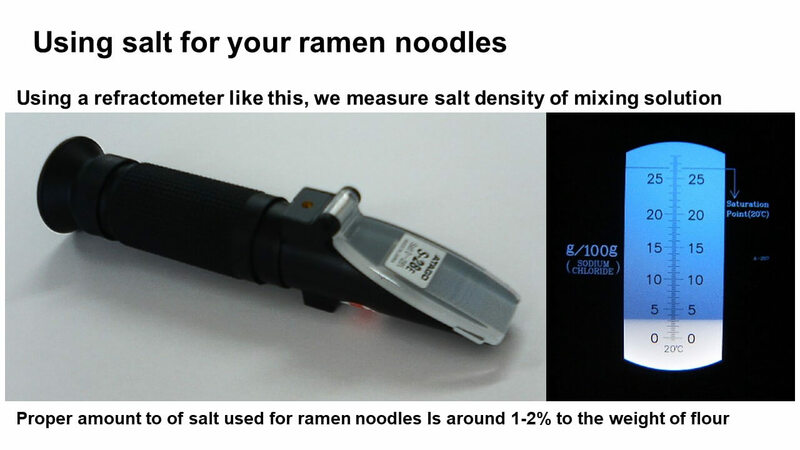 And, it also helps shorten cooking time of noodles. When making noodles with flour, we generally make them by adding not only flour and water, but also salt. The effects of salt on ramen noodles are as follows. · Tighten the gluten of the flour and increase the elasticity of the dough. · Suppress the activity of proteolytic enzymes contained in wheat flour. · Make the flavor of noodles better. · Add some salty taste to the noodles. 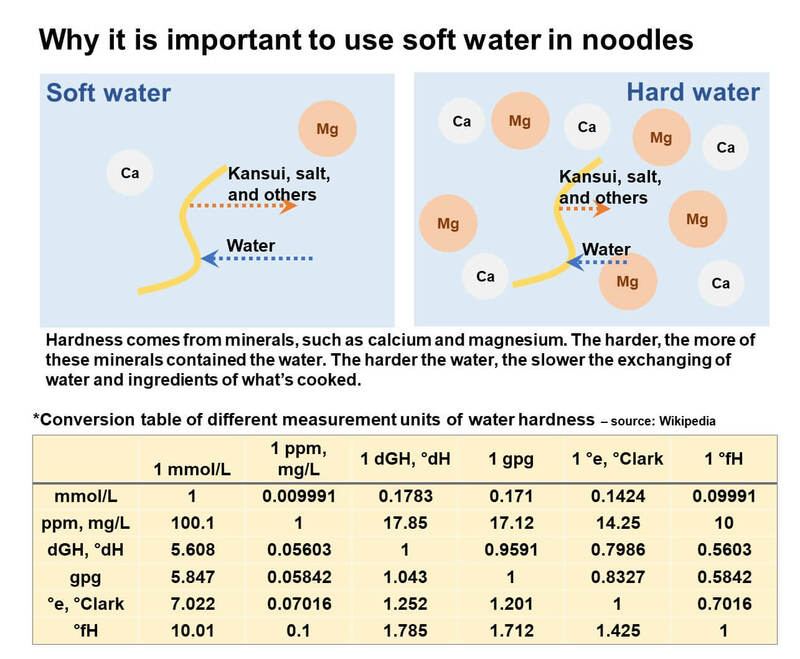 So, water, kansui and salt play important roles in making of ramen noodles. We now understand all the basic ingredients for ramen noodles. We can now start making noodles by making dough. The 1st noodle making step starts with mixing process. Let’s talk about it in another article. Please feel free to ask me if there’s any questions about what’s discussed in this article.